SiriusDecisions is well known for it's Demand Waterfall, a best-in-class framework for a systematic, organized approach to lead management. 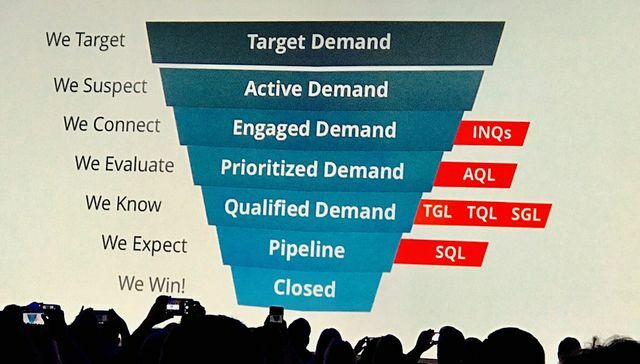 Today, at the SiriusDecisions Summit, the company unveiled it's newly architected waterfall: The Demand Unit Waterfall, and with it, said goodbye to the focus on leads. At its core, the new Demand Unit Waterfall was created to serve a heavily matrixed sales and marketing environment, and to drive even greater alignment and collaboration between marketing, sales, and product. It's important to note that market has evolved substantially over the past few years, with the growing importance of go-to-market strategies based on buyers, predictive analytics, and of course, account based marketing. With these shifts, B2B buyer echelons have expanded to include market, account, buying center, buying group, and personas. Buyer needs, fit and urgency are then measured on three dimensions: organizational, functional, and individual. The end result is an understanding of buyer groups and Demand Units, which ultimately flow through the redesigned Waterfall. In the simplest language, the new Demand Unit Waterfall enables B2B sales, marketing and product teams to seamlessly work together to better target, suspect, connect, evaluate, know, expect and win new customers.